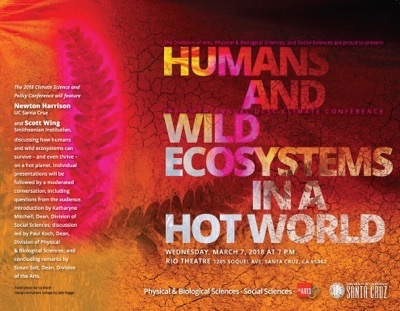 Free public lecture March 7 at the Rio Theatre "Humans and Wild Ecosystems in a Hot World"
"Humans and Wild Ecosystems in a Hot World" will take place on Wednesday, March 7, at 7 p.m. in the Rio Theatre in Santa Cruz. The event is free and open to the public; advance registration is required. Keynote speakers Newton Harrison and Scott Wing will make individual remarks, followed by a moderated panel discussion that will include questions from the audience. Harrison, who pioneered the ecological art movement four decades ago, is internationally renowned for work that addresses sweeping environmental challenges, including how urbanization and climate change are impacting ecosystems. Working at the intersection of art and science, Harrison—in partnership with his wife Helen—collaborates with biologists, ecologists, architects, planners, and politicians to expand dialogue and change public policy. The Harrisons' highly acclaimed body of work includes The Force Majeure, which focuses on rising water levels and temperatures around the world. Now an eminent professor of art at UC Santa Cruz, Harrison continues to work where the forces of conservation collide with exploitation, most recently on forest systems. Saving the West seeks to help forest systems adapt to climate change by reducing fire danger and protecting water supplies. Scott Wing is a biologist who explores evolution, ecology, and climate change at the Smithsonian National Museum of Natural History, where he is curator of fossil plants. His research focuses on the Cretaceous and early Cenozoic, a period of globally warm climate beginning 150 million year ago when flowering plants were emerging as the dominant form of terrestrial life. He has long worked to uncover the causes and effects of a sudden global warming event that occurred 56 million years ago that has many similarities to current, human-caused changes in the atmosphere and climate. His research is based largely on fieldwork and analysis of fossil plants. For the last six years, Wing has been on the core team planning the new permanent fossil hall at the Smithsonian, the largest and most complex renovation in the museum's history. The hall will reopen in 2019. Following their individual presentations, Harrison and Wing will be joined in conversation with moderator Paul Koch, a professor of Earth and planetary sciences and dean of the Division of Physical and Biological Sciences at UC Santa Cruz. Susan Solt, dean of the Arts Division and distinguished professor of theater arts, will give concluding remarks. "As befits the scope of the challenge of climate change, this program showcases the talented people across the disciplines who are grappling with this issue," said Katharyne Mitchell, professor of sociology and dean of the Division of Social Sciences, who will introduce the program. "I look forward to an enlightening evening." This annual conference is being cosponsored this year by three academic divisions: Arts, Social Sciences, and Physical and Biological Sciences.